One of the most important adages on the Internet is: “If you are using a website for free, you are not the customer… you are the product being sold.” The emphasis here is on understanding who the customer really is. If you are going to sell a product — and create a business selling a product — you must know who your customers are (and ensure you will get more). I’m bringing this up because (a) it is lunchtime (when I can write about ideas), (b) two articles came across my RSS feeds that put the brain in motion, and (c) I’ve got the whole 99 seat discussions that have been going on in my mind. As you know, I’ve been very involved in those discussions, and have been trying to bring the audience viewpoint to them. The average age of the Touring Broadway theatregoer was 53 years. Ninety-two percent of Touring Broadway theatregoers were Caucasian. The most commonly cited sources for show selection (other than being part of the subscription) were: the music, personal recommendation, Tony Awards and articles written about the show. Theatregoers said that the most effective type of advertising was an email from the show or presenter. In Los Angeles, this equates to the audience you would find at the Pantages or the Ahmanson. I subscribe at the Colony, and in the past have subscribed at the Pasadena Playhouse. When I go there, what do I see? Again — an older, caucasian, wealthier audience. We feel young — and we’re 55! Even when I go to Cabrillo Music Theatre — a regional house — what do I see: an older audience. I’d even be willing to bet you’ll find similar audiences if you look at regional community theatres that do similar programming: Glendale Center Theatre, Canyon Theatre Guild, etc. I’ll scream the point of the above: IF OUR AUDIENCE REMAINS OLD AND WHITE, THE FUTURE OF THEATRE IS BLEAK. Don’t believe me? Where is the audience for full opera today? On the other hand, I subscribe at Repertory East Playhouse, an 81 seat theatre in Newhall that falls on the intimate scale. The audience I see there has a broader mix: young adults (in their 20s-40s). I go to theatres in NoHo and Hollywood and West LA. Again, a much younger — and much more diverse audience. 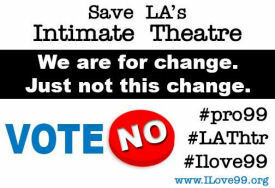 Here’s the message to shout regarding this: INTIMATE THEATRE DRAWS A YOUNGER AUDIENCE DUE TO PRICE AND EDGIER SHOWS. Now, to bring everything together as lunchtime is coming to a close (and I need to present in under an hour): What will be the impact if the AEA proposal passes? (1) Ticket prices will go up and discounts will go away as theatres have to cover the additional costs of AEA actors, (b) edgier shows will be eschewed in favor of safer fare that will bring in paying audiences; and (c) those safe audiences will be wealther and courted to provide increased donations to cover increased costs. A vicious circle will be created and… let me shout the net effect: WE WILL GIVE UP CREATING NEW AUDIENCES FOR LIVE THEATRE IN FAVOR OF THE WEALTHY, NEARLY DEAD AUDIENCE. Just a little salad left: The conclusion of this is that AEA is shooting itself in the foot: By destroying the potential of the new audience, 20-30 years down the road, there will be no one to pay to see AEA actors in large AEA shows. So not only is an approach like the 99 seat plan (which does need updating) an incubator for authors, designers, and actors, it is an incubator for new audiences. Remember folks: without an audience, actors are simply bloggers in the wind. ← Previous Previous post: What Does It Cost To Be Kind?